Venture capital firm Exfinity Venture Partners has led a $2.75 million (around Rs 18.3 crore) Series A funding round in logistics management platform Locus, run by Mara Labs Inc, with participation from Blume Ventures and BeeNext, besides Rajesh Ranavat, managing director of Fung Capital. Existing investors also participated in this round. The startup, headquartered in the US with an office in Bangalore, had received seed funding from early stage investment firm growX Ventures, Bhupen Shah, Manish Singhal, Amit Ranjan and others in July last year. Bhupen Shah is co-founder of US-based technology firm Sling Media, while Manish Singhal is founding member at crowd-funding platform LetsVenture. Amit Ranjan is an angel investor. The funds will be used to strengthen its technology offerings and expand the team, the company said in a statement. Founded in March 2015 by Nishith Rastogi, a BITS Pilani alumnus, and Geet Garg, an IIT Kharagpur alumnus, who had earlier worked together at Amazon, Locus enables enterprises with technology to manage their deliveries with features including automated smart dispatches, tracking, and fleet visualization, proprietary geocoder and proprietary route deviation engine. The company offers the entire logistics technology stack in the form of a PAAS (platform as a service). The Locus solution factors in real world fuzziness to support iffy networks, inaccurate addresses and hundreds of other exception scenarios. It can also club orders in real-time re-routing to maximize throughput, said Balakrishnan. Sanjay Nath, co-founder and managing partner, Blume Ventures, added, "Last-mile delivery remains a vital pain point for e-commerce and logistics. We're excited by Locus' deep-tech platform driven approach." Urban Ladder has been one of the earliest users of Locus. According to the furniture e-tailer, Locus has helped them improve productivity by 25% in three months. Delhivery, Lenskart, FreshMenu are some of its paying enterprise customers. 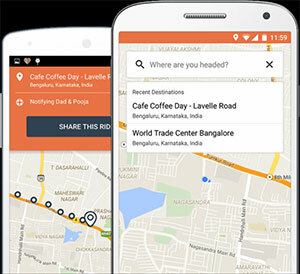 Last year, Locus had launched a safety app, called Ridesafe, which is powered by Realtime Route Deviation Detection (R2D2) engine. The app monitors a passenger's travel route and alerts if a driver deviates from the intended route, all the while taking into account information on alternate routes, traffic detours and several such factors. The surge in e-commerce industry sales has opened up a new wave of growth opportunity for logistics services firms. Given the scale of growth, Flipkart is trying to turn its logistics arm eKart into an independent business, while Amazon is expanding its logistics footprint. Last year in October, Snapdeal’s parent Jasper Infotech Pvt Ltd had invested $20 million in logistics firm QuickDel Logistics Pvt. Ltd, which runs operations under the GoJavas brand. Besides e-commerce majors strengthening their logistics divisions, there have been a bunch of startups that have mushroomed in the logistics space over the last 12-18 months. Pune-based e-commerce logistics firm Xpressbees raised about $12.5 million (around Rs 86 crore) in funding from its existing investors – SAIF Partners, IDG Ventures India, NEA, Vertex Ventures, and Valiant Capital. Mumbai-based Craftsvilla acquired on-demand logistics enabler Sendd for $5 million, in a bid to strengthen its logistics capabilities.